The heart and soul of APEN’s work is building and expanding a powerful membership base of low income API immigrant and refugee communities. APEN members and leaders guide all aspects of the organization’s campaign and movement building work. Leadership Steering Committee: A core group of APEN members from Oakland and Richmond make decisions on APEN’s priorities. APEN Academy: An eight-session training series helps members develop political consciousness and organizing skills. Electoral Organizing: APEN members engage greater numbers of voters in our electoral process, through precinct walking, phonebanking and ballot parties. Basebuilding: APEN members outreach and recruit other members. Campaigns: APEN members develop important leadership, public speaking and media experience in leading our campaign work. 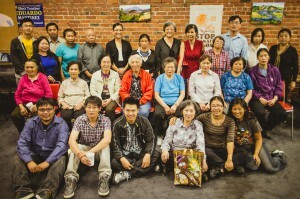 Grassroots Fundraising: APEN members support key fundraising activities to build financial support for the movement work. The first class of the APEN Academy celebrated their graduation on October 6 with a big BBQ with friends and family in Nichol Park in Richmond. Launched on July 21, APEN ran an 8-week academy to strengthen the leadership and organizing skills of APEN members in Oakland and Richmond. About 25 leaders are attending the academy, but the numbers are growing each week! Workshops were interpreted in Mien, Khmu, Cantonese, and Mandarin.